ROMEN CATCHER LY has been developed as a concentration of Nichireki’s know-how relating to road management built up over many years, including state-of-the-art laser technology, non-contact sensor technology, and computer control technology. Due to the flying spot method which utilizes a laser, all cracks 1mm or more in width are recorded while travelling at high speeds of up to 80km/hour. An optical shut-off measuring method is utilized which uses a CCD camera to record the images reflected from the laser beam that scans the road from directly above. The gathered imaging data is automatically analyzed by a real-time dedicated image processor to provide precise data regarding ruts. 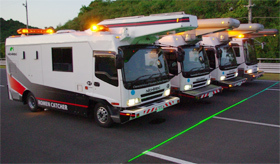 The height from the road surface is detected using the reflection of the laser beam shining from directly above, and is recorded on video while superimposing the distance signals. Automatic analysis is carried out by a real-time dedicated image processor to provide high accuracy data concerning the roughness. Longitudinal section profile data gathered from acceleration gauges and laser displacement gauges is recorded, and IRI (International Roughness Index) data is provided which is used for evaluating the ride comfort.